Free Delivery applies to orders of $100 or more. You’ll be the envy of your friends in this short sleeve crew neck tee from our 2019 NSW Supporters range. A stylish piece of classic supporters wear, it features a unique textured vintage style print on the chest and Blues team and sponsor logos on the sleeves. Whether you wear it to cheer on the Blues on any smart casual occasion, this stylish short sleeve tee will turn heads wherever you go. Canterbury’s Vintage League Tee from our 2019 NSW Supporters collection is a classic crew neck tee made with a soft, breathable mix of cotton and polyester. 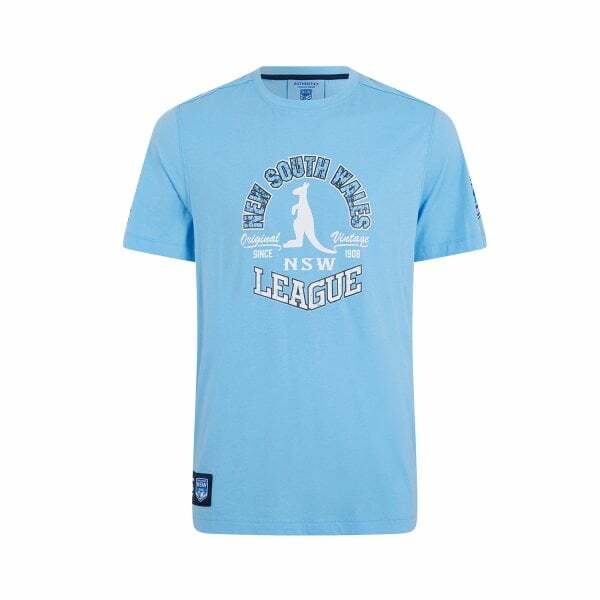 It features a striking textured vintage style print on the chest and Blues team and sponsor logos on the sleeves and will quickly become a favourite in your wardrobe as you find yourself wearing it on a variety of casual occasions. Vintage supporters wear with a vintage design; be sure you add this one to your State of Origin collection. Orders over $100 are Free standard shipping within Australia. The Canterbury Shop will only ship orders within Australia. All parcels are sent via Eparcel and have a full track and trace service. © 2019 Canterbury. All Rights Reserved.